Both talc and non-talc body powders are incredibly easy to apply. Basically, the best method to apply any body powder is to apply a bit of powder directly onto your feet (or elsewhere), and then rub the product into the skin. This tends to work a lot better right after a shower, when your skin is a bit more supple and clean. 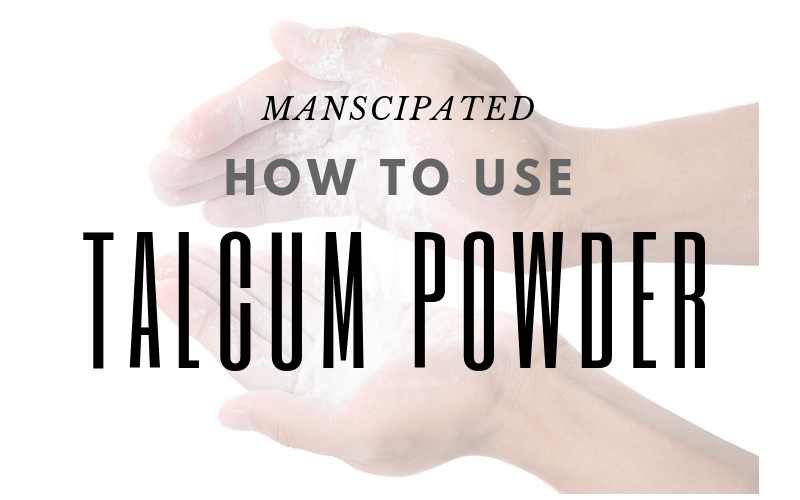 How to Use Talcum Powder? Talc is pretty easy to administer. Here’s an easy step-by-step guide on how to apply it. Make sure the area where you will apply it is dry. Applying any type of body powder tends to work best right after a shower, as your skin is clean, supple and elastic. However, you’ll have to make sure you are completely dry. It’s always best to apply talc in the bathroom shower cubicle or else your floor will be covered in white particles, so just be careful to sweep up the excess talc that inevitably lands elsewhere. I have found that it’s a lot easier to simply apply my body powder to the nether regions inside the shower cubicle, as all the excess will fall there instead of onto the outside bathroom floor. For feet, I have found that putting your feet onto the toilet bowl (hopefully yours are clean!) or the sink works best, as with feet it’s a bit easy to apply liberally. If you apply any kind of body powder in the bathroom, it will fall on the floor and then anyone who gets dressed is going to get a bit of powder onto their clothes. Although talc powder can be used to soak up moisture anywhere, it isn’t merely used to combat excessive sweating. It also serves as something of a body spray. Body sprays are quite popular these days, and while they do a good job of improving a man’s smell at low-cost, they don’t do anything else. Talc on the other hand not only reduces excessive sweat, but also gives off a sweet aroma. This is why it’s such a great tool to use in your ‘trouble spots’. Most of the world’s talc is mined in China, with other notable mining deposits located in Brazil and the United States. For decades talc was the primary ingredient in baby powders until the industry at large began to start using cornstarch-based body powders. However, it bears mentioning here that baby powder, and talcum powder, are slightly different things. Generally, the biggest difference between a bottle of Johnson and Johnson’s Baby Powder and Clubman Pinaud is strength; the latter will generally give off a more powerful scent, and be a bit stronger overall. In the past, the mineral from which talc is derived was often located in and near asbestos deposits, which would sometimes taint talcum powder products made for human consumers. This problem has largely been eliminated through the use of stringent quality-control measures. If you are at all concerned about this, simply switch to an all-cornstarch powder. It is basically as effective as talcum based body powder, and it’s not listed as a possible carcinogen. This is probably the best overall product out there right now. It’s a non-talc cornstarch-based powder that is infused with pumpkin seed, hops, oatmeal and aloe. The biggest benefit of this talc is its soothing effect, which comes from the aloe. It’s not priced too high, but my favorite thing about Chassis Man Care is it’s applicator nozzle. It’s probably the best I have used. The problem with most body powder nozzles, applicators and twist-offs is that usually you get too much product everywhere. Chassis Man Care’s nozzle is designed to avoid this problem. It spurts out just the right amount of product. I have found that it’s also really useful in applying it to the nether regions because of this. Very useful product, and I would typically recommend this over just about everything else to start with. If it’s the best that you are looking for, check out Balla. It’s made specifically to apply for men’s pubic regions, and it has a rather awesome name. What puts this fine Italian talc over the top however is it’s ability to keep your boys dry. And I mean desert-dry. So, if you’re a guy who works long-shifts or just suffers from excessively-sweaty balls and nether-regions, you might want to try it. It works rather well in that department, and best of all, comes in a few different scents. I’m quite partial to the original musk and oak scent myself. Gives a good ‘manly’ vibe down there, while not being overly fruity. This is a non-talc based body powder, so if you want to avoid talcum based products, I would recommend something like this. It’s a cornstarch-based powder that is infused with lavender and green tea, to give it a more earthy scent. It doesn’t smell as strong as the Balla powder. The real benefit for this talc however is it’s ability to help protect against chafing, especially in the pubic and pelvis area, so this type of powder may be the best option for athletes. It also has a really easy to use body applicator. Body powder’s three primary uses are; to reduce chafing, reduce redness and fight odor. Applying talc and body powder works best right after a shower, on clean, supple and elastic skin.